Using balloons in parties is a fun way to add color to the occasion. However, they can be used for much more than just decoration. Since they are inexpensive, colorful and fun, balloons have become versatile tools that kids entertainers and party planners who are creative now use. Today, balloons are used for much more than just decorating birthday events and here are creative ways to create an entire birthday party theme using balloons. There are different ways you can use balloons to invite people to your kid’s birthday party. First, you could deliver inflated balloons to them. If you choose to go this route, then inflate your balloons then tie them closely together. Use a pen to write details of the party on the balloon then pass them on to the guests you intent to invite. Another way to send out balloon invitations is to get your invitations printed out then roll them to form small scrolls. Inflate your balloon then stick the scrolls of invitations inside the balloons before delivering them to your guests. Once you hand the balloons over to your guests, let them pop them to get their invitations. If these two ideas don’t work so well for you, consider inflating the balloons and leaving them untied. Write the details of the party on the outside then deflate the balloons. Place each deflated balloon in an envelope and include a note advising your guests to inflate their balloons to view an important message. There are different, interesting ways you can use balloons to decorate your kid’s party. For instance, you can fill balloons with helium and tie them together then attach decorations that rhyme with the color of your home to the ends of the tie ribbon. Once you have done that, leave the balloons to float up the ceiling in the house such that the decoration attachments dangle in the party space. You could also decorate dining table by tying helium balloons on each dining chair. Also use party flavors as weights to hold balloons in position then have the balloons floating above the dinning space. If you find helium costly to use, you can opt to tie ribbons to the ceiling then dangle balloons rather than dandling the ribbons from the balloons. Tapping enough balloons on the walls of the house is another way of creating a backdrop that is full of color. You may opt to arrange the balloons on the wall in a way that spells the words ‘happy birthday’ or shape the arrangement to write the age of your kid on the wall or both. You could make up a winding path to the party venue by placing golf tees on the ground then attaching balloons to each golf tee. If you are settling for an evening party, consider inserting glow sticks to the balloons before you inflate them. Once inflated, hang the balloons in the party space to create great balloon lighting. Add fun to your kid’s party by injecting some balloon play activities. Consider games such as balloon drop where you fill a huge net with balloons then tack it to a ceiling. Once the guests to your party are all under the net, get someone to let the balloons off the net in a way that showers the kids with balloons. You can also play confetti balloons where you toss fill the balloons with confetti then toss them in the air and pop them up in the air. For this activity, ensure there is an adult present to do the popping. Balloon faces is another interesting balloon activity to consider. Hand each guest a balloon that is inflated and several craft items like colored markers, ribbon, glitter, stickers etc. Ask each of them to make funny faces on their balloon and see how that turns out. Dart painting with balloons can also be fun. Start by filling the balloons with several paint squirts then inflate each of them and attach them to canvas that is painted. Provide kids with plastic darts and have them throw the darts to the balloons. The paint will splatter on the canvas as the balloons pop and each guest can take their canvas home once all the balloons get popped. You definitely cannot eat balloons, but you can take cookie pops or fun cakes that are cut in balloon shape like mini pizzas, pancakes and sandwiches. 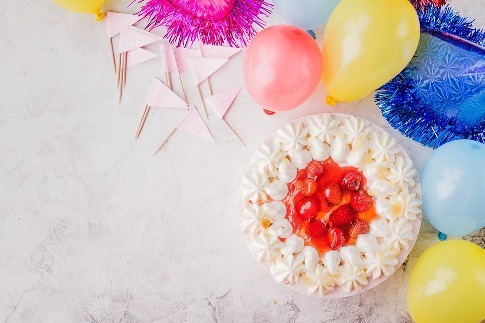 To add fun to your party food, you can also attach toothpicks to small inflated balloons then use them as toppers on cupcakes or tea sandwich picks. Once done, take advantage of the love kids have for balloons and give each one of them a balloon to take home. If you have party takeaways to give your guests, you can opt to dangle a balloon on each one of them as a way of dressing their takeaways.